When we in the West think of a “postcard,” we usually think of a note from Aunt Suzie on her vacation in Atlantic City or a card with a picture of a church my brother visited while going around Europe. In the West, postcards developed once European countries and the US had established postal systems and regulated postage. Oddly enough, writing was not allowed on the address side of the postcard in the US until the early twentieth century. Postcards in the West are interesting historically, and sometimes socially. However, in Japan the introduction of the postcard was part of an amazing campaign at modernization begun in 1868 by the Emperor Meiji (reigned 1868–1912). The Japanese believed the industrialization and adoption of western cultural institutions would help them avoid colonization as had beset neighboring countries in Asia. The first postcards were introduced in Japan in 1873. The Japanese postal service had reformed based on the system in England beginning in 1871. For the next twenty-seven years, the Japanese government maintained that it had the exclusive right to publish postcards. Based on the Austrian model that emerged in 1869, color lithography for postcards rapidly replaced the preferred colored woodcut print and a means of printing. By 1887, postcards were the most popular form of mail in Japan. They were offered in all kinds of shops, displacing the establishments that had once sold woodcut prints. In 1900, the Japanese government announced that it would relinquish the publication of postcards to the private sector. This had immense impact on Japanese society. 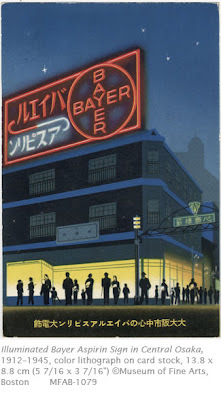 Postcards were now issued from every corner of Japanese society, including medical schools, the military, artist groups, and even department stores. The postcard made possible the rapid circulation of exciting and innovative visual vocabulary that documented how Japan was rapidly becoming a modern culture. Subject matter of Japanese postcards during the most flourishing period (1900–1930s) varied from images of women similar to ukiyo-e prints to scenes that symbolized the modernization of Japan. This postcard obviously falls in the latter category. As a scene from downtown Osaka, the card brilliantly shows how the Japanese postcard is a fascinating documentation of the westernization of Japanese culture in the early 20th century. This particular scene also depicts one of the Elements of Art taught in many Davis textbooks: Two-point linear perspective. The Museum of Fine Arts in Boston has a collection of some 20,000 Japanese postcards.